What a tiny and interesting place. A small hook of land provides good protection from the seas that are kicked up by the habitual Northerlies, but almost no protection from the Northerlies themselves. 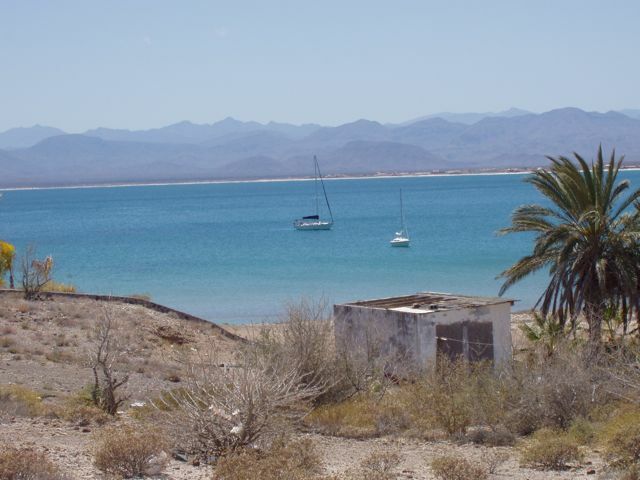 Never the less, the Mexican government has identified this small area as a potential resort area and is pouring money into it to develop its potential. 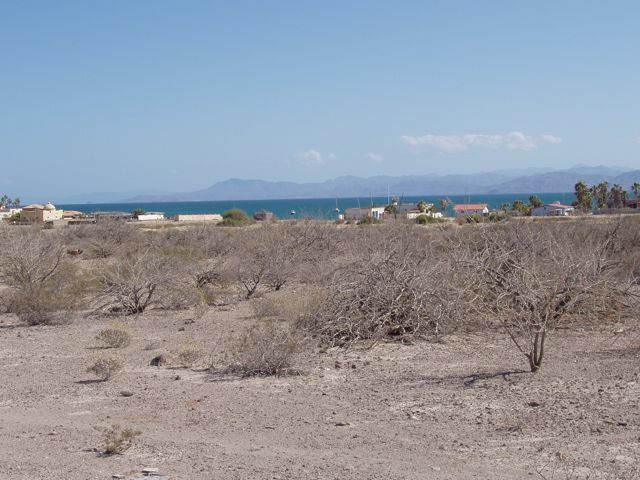 It's very close to Santa Rosalia to the North and to Mulege to the South, both of which can provide badly needed power. So far, it's local diesel generators or solar. We stopped here for a day and a half to see the few sites and wait out some winds. 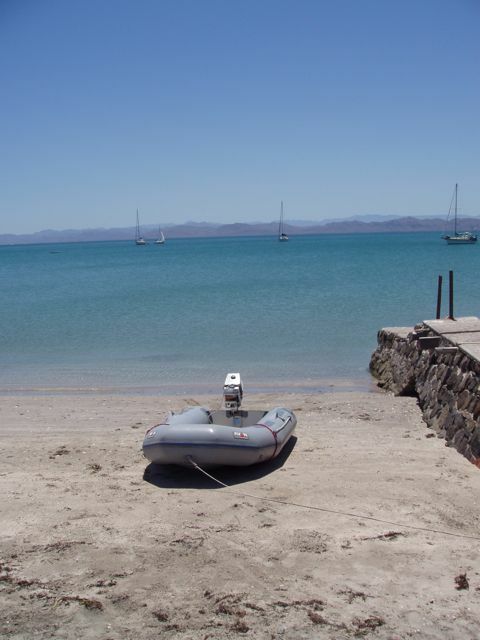 Little Wing, our dinghy, tied to shore. Our trusty 1980s vintage Sears outboard carries us everywhere. Thanks, Pete. 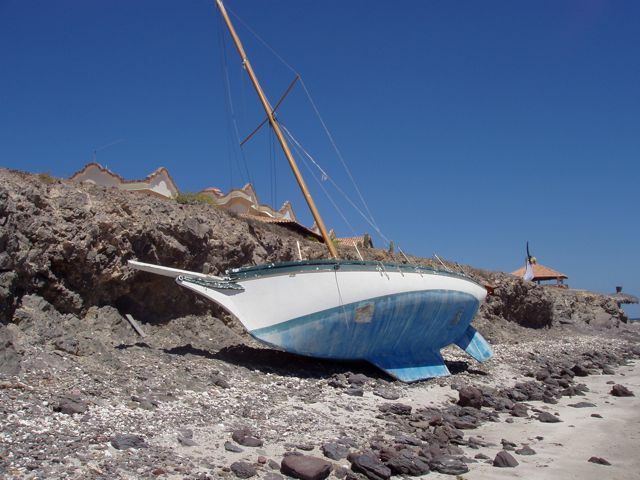 A sorry sight to a sailor: an abandoned sailboat, washed to shore. Doubtless the result of dragging anchor in a hurricane, the boat was probably too old to salvage, so here she rots. 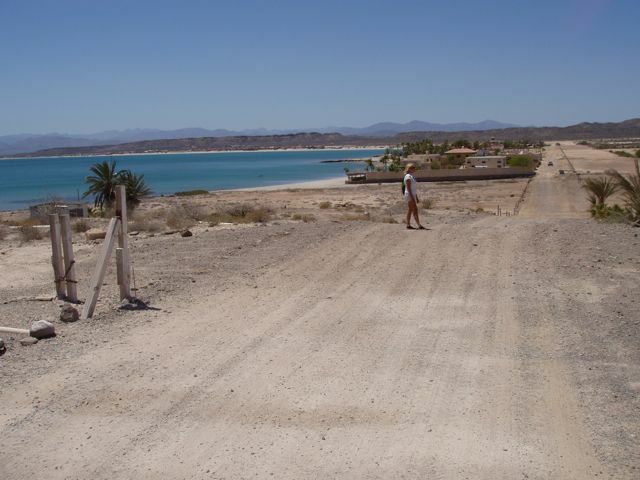 Lovely Conni strolls down the hot, dusty roads of Punta Chivato. Private homes are in the distance, most with enormous solar panel farms. Wings (at left) at anchor, awaits our return. A resort that was reputedly open, is now only seasonally open. It is owned by Italians who return and open the beautiful resort and grounds. 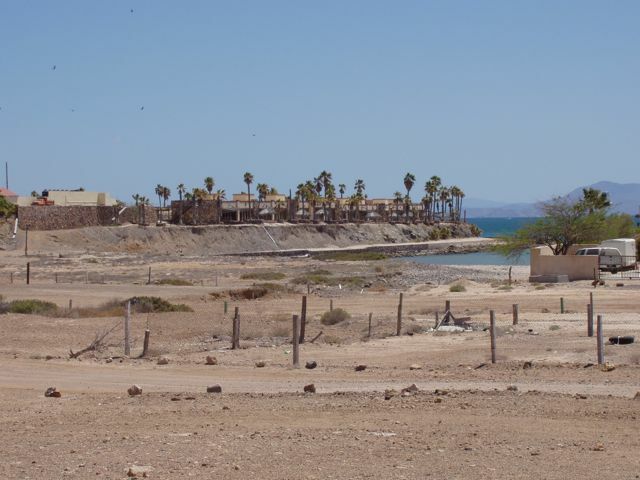 As a tribute to Mexican honesty, the resort has not been vandalized. Just below the wall of the resort is a crescent of beautiful, white sand beach. Fore! 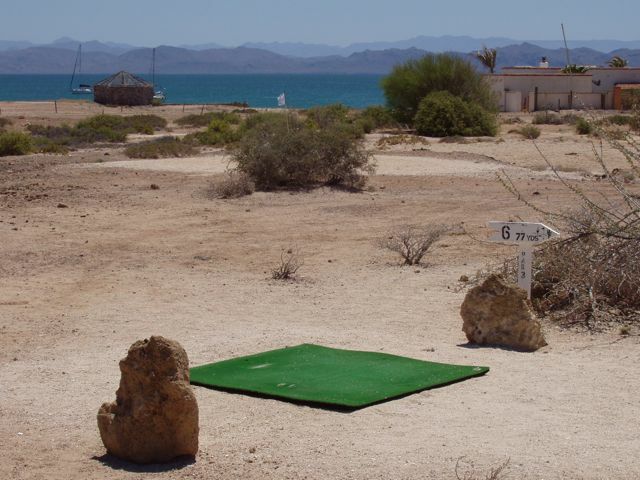 The Puerto Chivato International Golf Course is open for business. We did see Gringos playing in the heat, a cause for mirth to the locals. 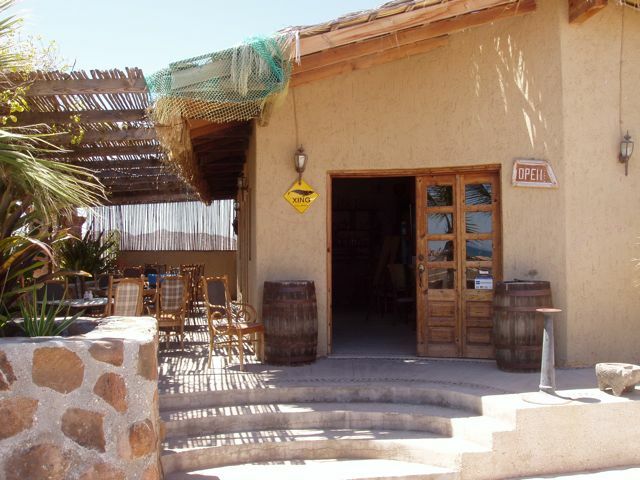 Hotelito Punta Chivato. We stumbled onto this beautiful little oasis of cool and comfort and took advantage of their Wifi, great drinks, excellent food, and warm hospitality. 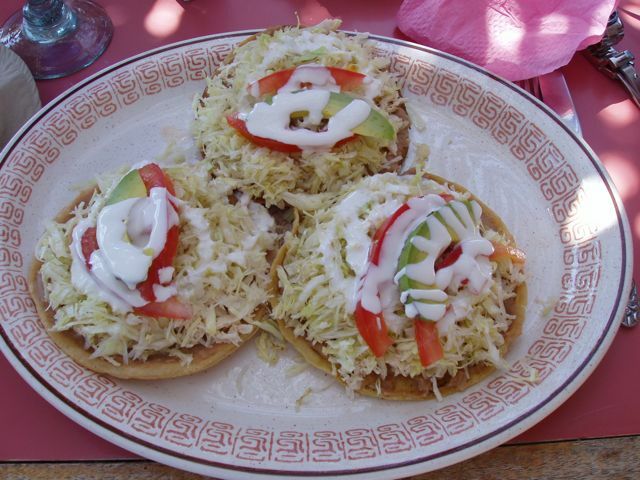 Tostados con pollo: tostados with chicken Scrumptous! Gringo Conni enjoys a Club Sandwich in the dappled light. It takes vision to see a tourist destination here. It's hot and dusty now. 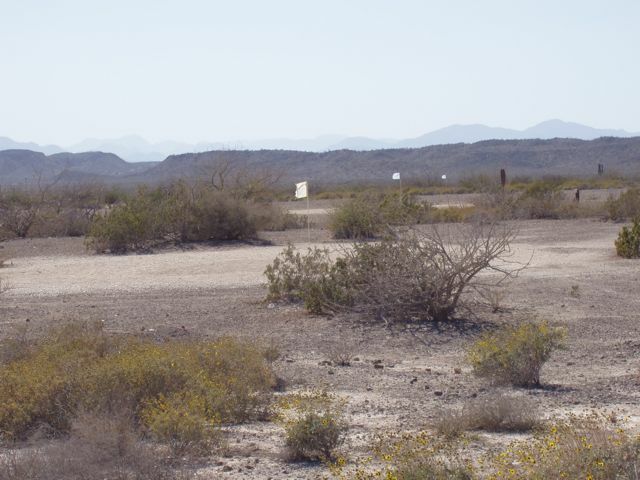 A set of golf marker flags try to survive the violent winds of the area. Somehow, hitting a ball with any hope of coming near your goal seems pointless in the 20 knot winds.